Someone call the cops 'coz Peter Griffin stole my heart! Ebay Flat Top Fedora Hat / Primark Jumper / Internacionale Shirt / DIY Tights (I made them) / Amazon.co.uk Platform Boots / Matalan Ruck Sack. Embracing my inner grunge once again, it's all about 90s grunge glamour with an added dose of gothic romance. I was feeling rather spontaneous today, going for a grunge look; softened by the humorous jumper. There I was scouring through my closet when I came across these purple tights which I bought 3 years ago. They looked a little worn out, so I went ahead and ripped them up! A little DIY is always a great solution. Its quite enjoyable ripping up tights, such a strange sensation. 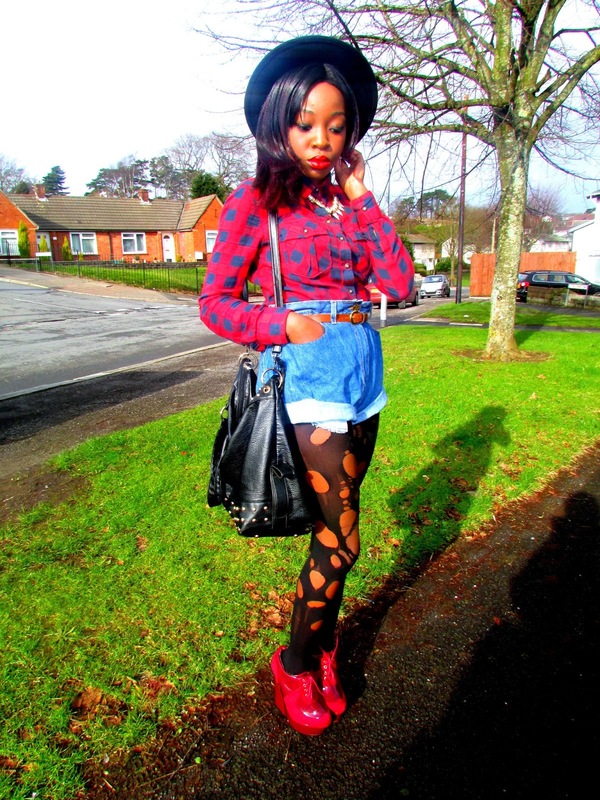 Quite a few people have asked me to do a DIY post on how to rip tights, will do one soon. Oh and how cool is my Peter Griffin jumper? I bought this jumper from Primark for just £10 a month ago. And yes, it was in the men's section! What can I say, I can't stay away, I totally love the baggyness.. I teamed it up with a bright coloured shirt, the ripped up tights and platform boots to achieve a grunge look. No grunge look is complete without some sort of hat and a cute rucksack, its only inevitable. Go fourth and be grunge! Hope you guys have had a lovely day! Have you done any DIY's lately? 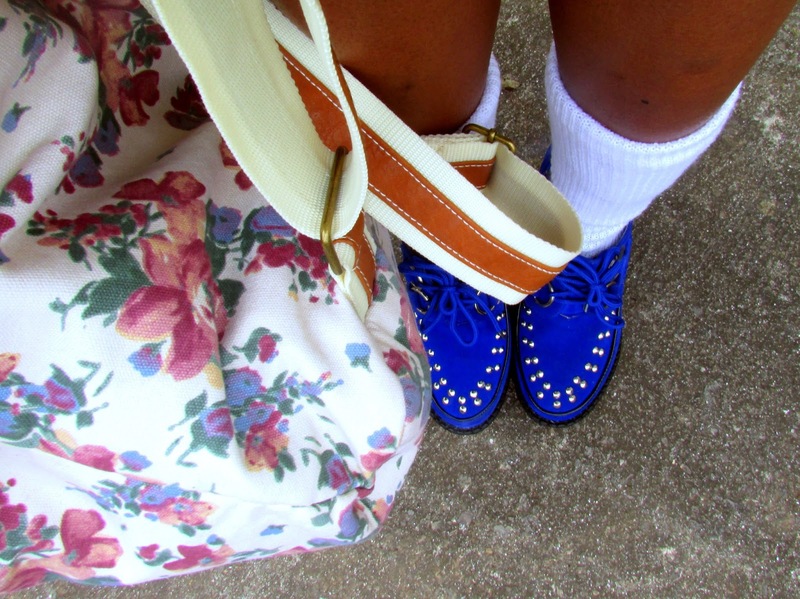 H&M Bowler Hat / Primark Woolen Cardigan / H&M Dress / New Look Socks / Amazon.co.uk Wedge Creepers / Peacocks Rucksack. Have you ever had those days where you just felt like the ultimate nerd? Well, today was one of those days. Debuting my new mint/green cardigan which I bought from Primark for just £5, my look today was rather simple with a 'geeky' feel to it. I absolutely love this woolen cardigan, the colour is beautiful and its so soft, perfect for these cold winter days. It was only inevitable that I would end up buying this cardigan, my obsession with colours is now out of control. And the Geek Glasses are making an appearance again, I haven't worn them in a few weeks; they just had to come back. I paired up the cardigan with a simple floral dress that I bought in H&M 2 years ago for £8 *Yes, I do remember the price haha*. Adding a pair of white socks, wedge creepers and a rucksack, my 'geeky' look was born. As for the bowler hat, well, you know me; hats are my addiction! My International Giveaway ended last night! Thank you so much for entering. I will be announcing the winner this Friday. Hope you've all had a lovely day! First attempt at creating Ombre Lips! 1. 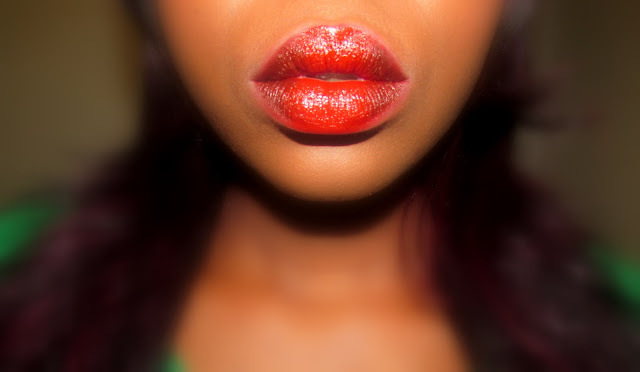 The first step is definitely the most important step, exfoliate your lips. This helps keep them smooth and to make it quick; use a toothbrush with soft bristles to remove dead skin from your lips. Now apply Lip balm or vaseline; I have used vaseline. 2. 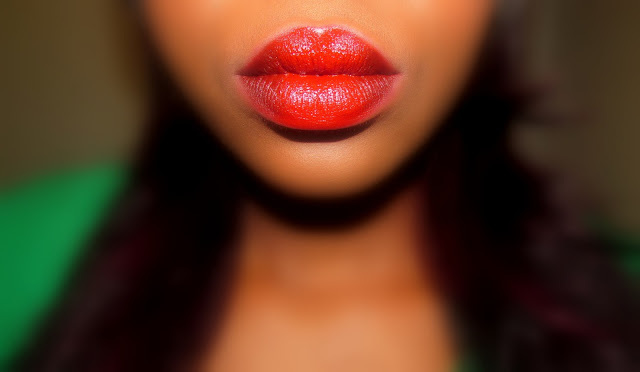 Next, I used the red lip liner to outline my lips. 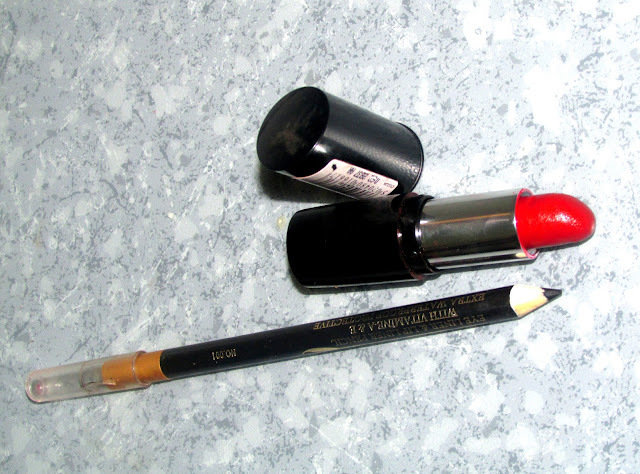 Your lip liner should always be sharp. 3. I then applied my Maybelline red lipstick (Shade ) to fill in the rest of my lips.This shade is one of my favourite lipsticks which creates distinctive red lips. 4. Now for the important part; to achieve the ombre look, I used the black lip pencil in the corners of my upper and lower lips. Be careful not to go into the centre too much. And voila, this is my ombre look. Its not perfect but its a start, looking to get better at it as time goes by, haha. 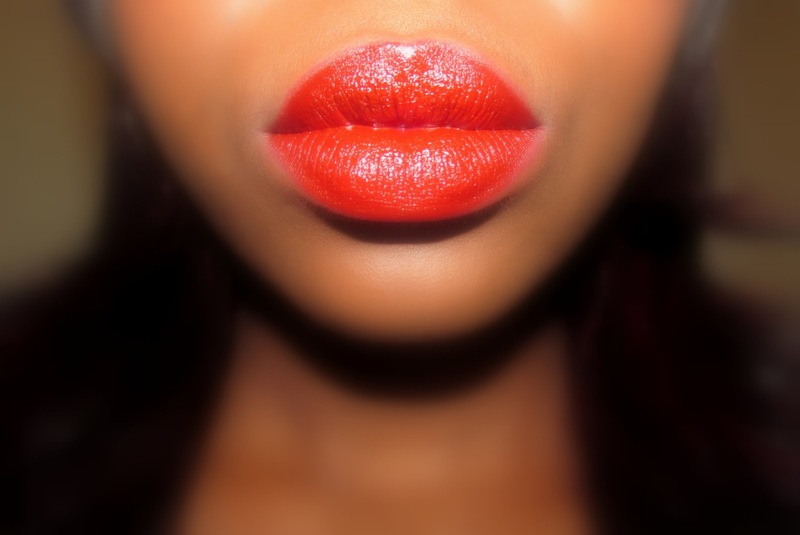 Have you tried out Ombre lips yet? What do you think? Its a Black&White Affair: Night Out Outfit! Primark Bustier Top / Jane Norman Lace Skirt / Primark Gold Clutch / New Look Red Heels. A few people have asked me to do outfit posts of what I wear out and this is the first of those posts. When I'm going out, I never really have time to snap pics and so I got ready quite early yesterday so that I can have a few photos of the outfit snapped. 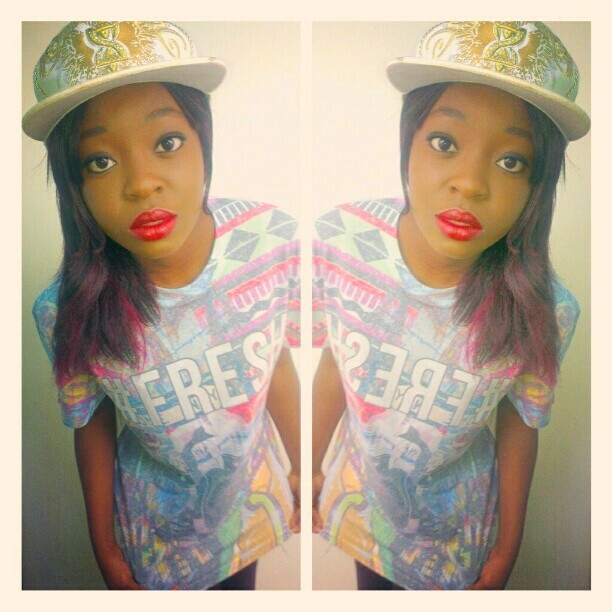 I always post what I wear on night outs on my instagram though (n_nyasha23). Anyway, it was my 2 of my friends' birthday celebrations (they are twins) last night and the theme was Black and White. I have been wanting to wear this Jane Norman skirt for so long. I instantly knew this was my chance to wear it after finding out it was a black and white party. When I go out, I tend to wear dresses and skirts more than anything, they are just easier to work with; minimal jewellery and rather high heels. I paired up this beautiful Jane Norman skirt which I am completely in love with, with a black and white zebra print boobtube crop top that I got from Primark for just £3. I also added a pair of big gold earrings and a gold clutch which I got from Primark for about a fiver to match. It is such a simple clutch but really do love it, quite big which is great because I take a lot of stuff with me on a night out. Even though it was a black and white party, I wore bright red heels to match my lipstick, you can't go wrong with red lippy. I love small hints of colour and the red heels added that little bit extra. This skirt is such a great staple piece; this is definitely not the last you've seen of it. What do you tend to wear on a night out? Its a D E N I M affair! 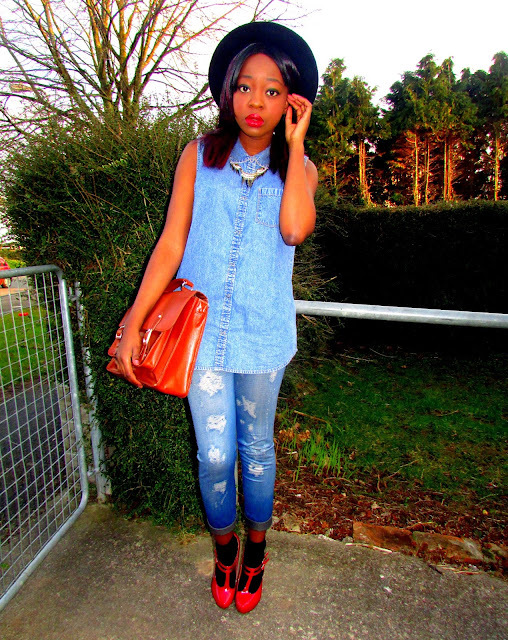 Ebay Flat Top Fedora Hat / New Look Necklace / Matalan Denim Shirt / Ebay Denim Leggings / New Look Heels / Primark Satchel. I'm back guys, I apologize for leaving you hanging yesterday; I had such a busy day. It felt so weird not writing up a blog post yesterday. Anyway, today I'm donning D O U B L E D E N I M! With yet another busy day ahead of me, comfortability is the order of the day and this outfit surely does me justice. 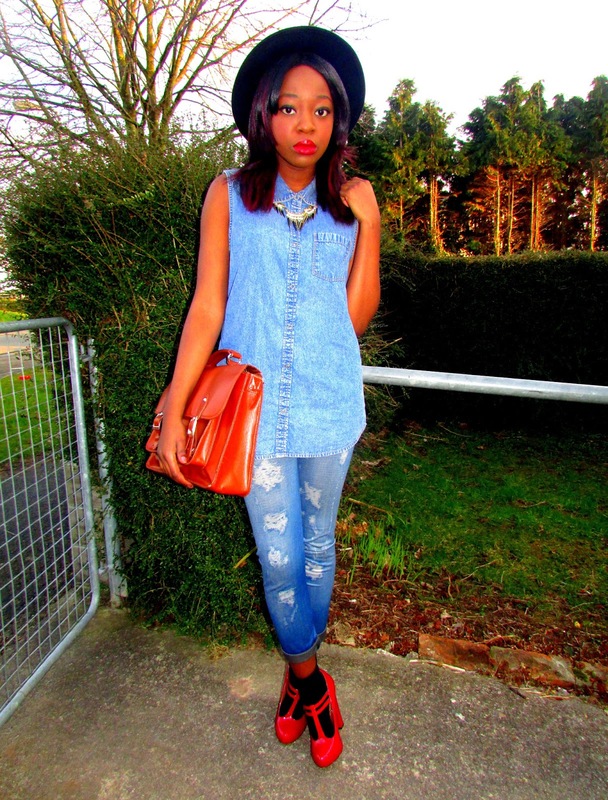 I have wanted to show you guys this Matalan denim shirt for ages, its just perfect. Just in case you are wondering, yes I practically live in Matalan as well as H&M; they are after all some of the best stores around. 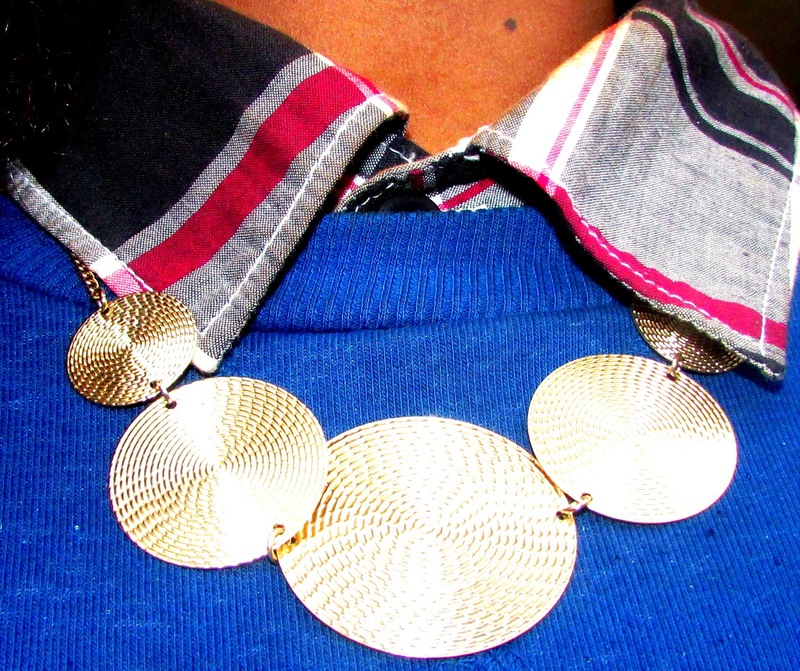 To tone down the 'denimness' of my look, I added a bronze spike necklace. Fend of the fiends with a flat top fedora hat. To brighten up my look a little, I added a pair of red heels and a brown satchel. This satchel looks divine firmly clutched in my hands and I still cannot believe it is from Primark; they have stepped up their game. I take pride in clothing that is practical and wearable in any type of weather and every single piece in this look sure is. Teaming it up with a leather jacket for warmth and John Lennon style sunglasses, my 'urban street style' look was born. Matching my lips to my shoes is something I do quite a look and today was no exception, I just had to! I also have some news I have been meaning to share with you guys since last week. I just so happen to be one of the four winners of the River Island Styled by You Competition which was being run by Company Magazine. Super excited to be styling a shoot for Company Magazine's May Issue and meeting the other girls. This is definitely the highlight of my 2013 so far.. Read more here! Don't forget that my International Giveaway is open until the 26th of February, Enter HERE! Have a lovely day guys! Footlocker Snapback / Matalan T-shirt / DIY Self Made Shorts / Ebay Creepers / JOOP Rucksack. It is pretty obvious what inspired my look today; only the best TV Show ever made, Fresh Prince of Bel Air! Debuting just about the most awesome t-shirt in my wardrobe, I have been wanting to show you guys this text t-shirt for ages. The graphic print on it is superb, its one of those t-shirts that easily captures people's attention. Its so light outside, you can barely see my tee in the photos, boo! Though I'm rocking this rather amazing text tee, can someone tell me what is actually meant by #fresh, haha? Its just one of those words that I see and hear a lot (fashion context) but have never been interested enough to ask about it. Anyway, the best summation for my look is '90s urban street style'. Didn't know I wore snapbacks too did you? 'Halloooo again' says my self made boyfriend shorts, I just can't stay away from them! My favourite DIY so far in my wardrobe. 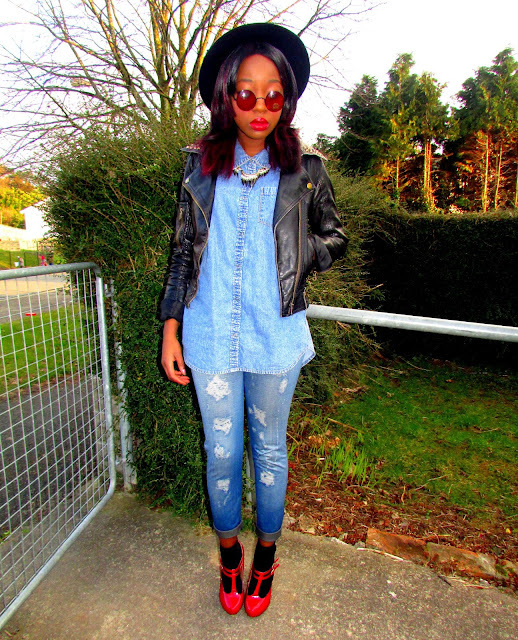 I love this look, its so 90s; I was born in the 90s after all. 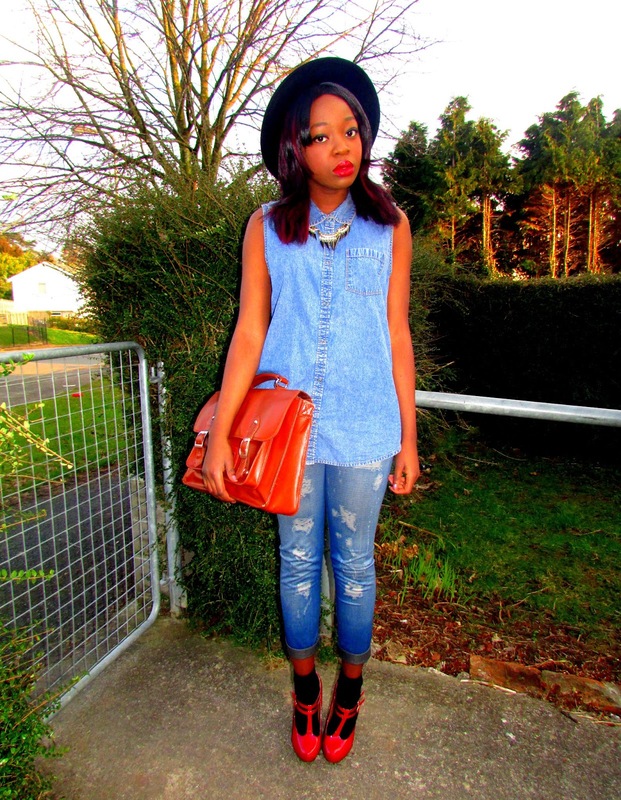 I teamed up my look with a pair of creepers to create a more modernised look. I finished it off by adding this JOOP vintage rucksack that my mum got for me maybe 6 years ago. You can't go wrong by adding some red lippy. Looking for any excuse to just cut loose! 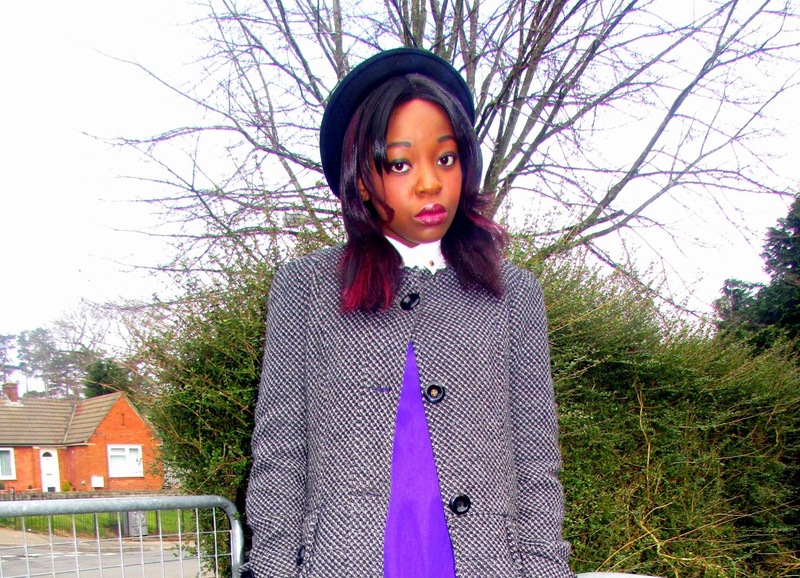 H&M Bowler Hat / Misguided Dress / H&M White Shirt / New Look Necklace / Amazon.co.uk Platform Boots / Primark Coat. Gone are the days of bearing legs? Phht, I think you mean 'gone were the days of bearing legs.' The weather has been rather merciful on us today, its normally poop; no rain, no wind and its actually quite warm outside. Taking advantage of such weather, I decided to give my tights a rest and bare those legs. As you all may know already, my favourite colour is purple and so its quite obvious why I am very fond of this dress. Besides the colour, I love the sequin detailing, its such a great touch and adds a hint of elegance. I received this dress as one of my 20th Birthday gifts from my boyfriend back in 2011 (I feel old but yay it still fits). Don't really know why I am surprised that it still fits, maybe because I have been a whole lot of junk lately but lets be honest; I stopped growing a long time ago; oh hail high metabolism. Back to the outfit, I wore a white shirt underneath the dress for a preppy feel. I love that this dress has long sleeves, makes it more versatile and easier to wear both in winter and summer. 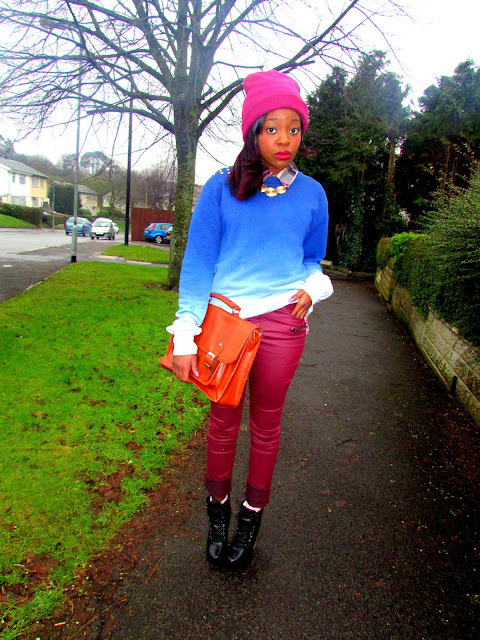 The bowler hat had to make an appearance as I feel it goes so well with this look. Now meet my black and white coat, I have had it for two years but rarely ever wear it, don't think I even wear most of the clothes in my wardrobe. Hear is to hoping the weather stays dry & its all fine and dandy clear skies! My International Giveaway is open until the 26th of February, Enter HERE! What percentage of your wardrobe do you actually wear? Stare into the sun, its a one way ride! Ebay Flat Top Fedora Hat / New Look Necklace / Primark Check Skirt / DIY Boyfriend Shorts / New Look Thin Belt / DIY Ripped Tights / DIY Ebay Leather Jacket / Matalan Bag / Amazon Ankle Heels. 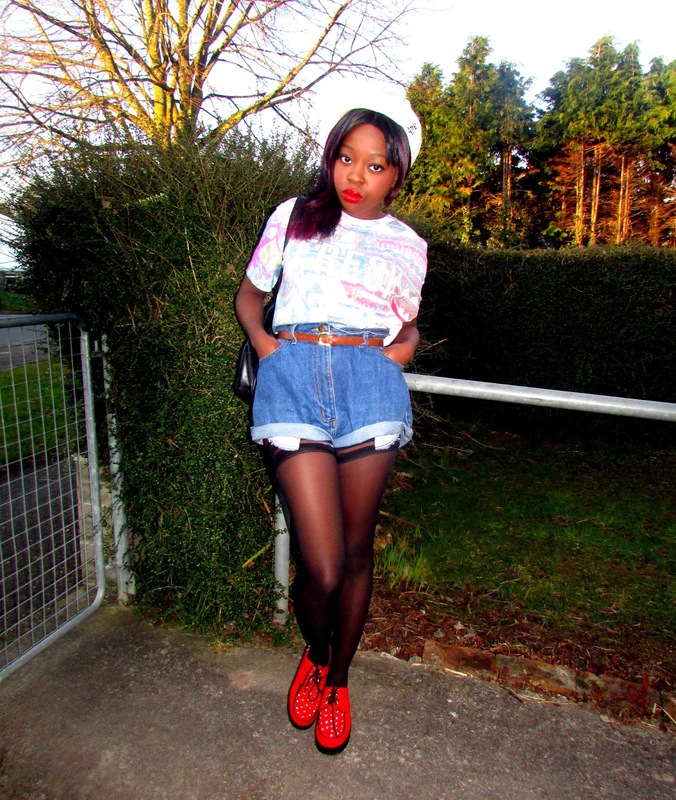 When the winter sun comes out, the DIY ripped tights come out to play! I am getting rather fond of grunge lately and will be experimenting a bit more with it in the coming weeks. This morning I was feeling a bit creative, it was only inevitable that I would end up with a needle and thread plus a pair of scissors in my hands; not forgetting my brother's old pair of jeans. In just a few minutes, these bad boy shorts were born. I have wanted a pair of boyfriend style shorts for a while now but they are rather pricey (you can get them cheap on Ebay from China mind, delivery takes a while to get here though) hence decided to make this pair myself from my brother's old jeans; recycling much? I did an outfit post a while ago where I first debuted these ripped tights which I also made myself. When your tights are ripped, rip them some more! It is the perfect solution, ripped tights always add a grunge feel to an outfit; instantly making it a bit edgy and daring. Being a student and all, I don't have money to flaunt about and so rely on my hands as the ultimate DIY tool. 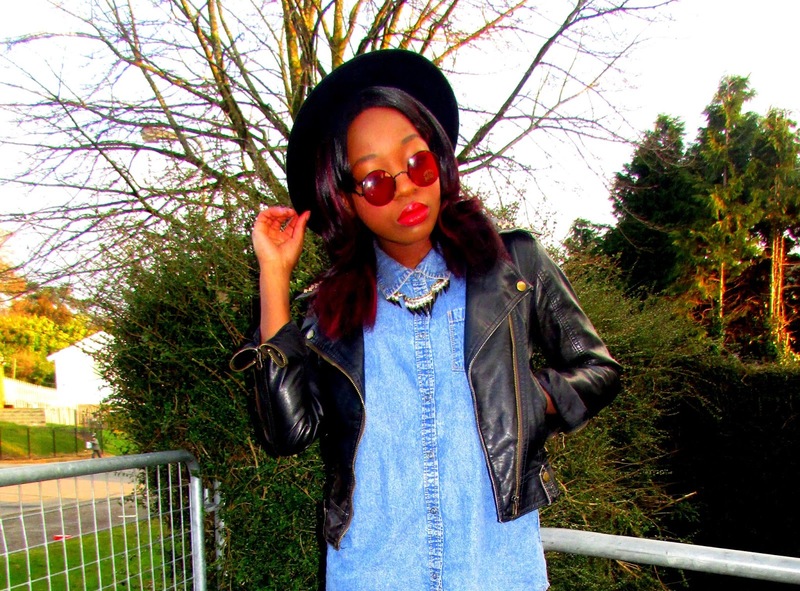 Teaming them up with a bright coloured check shirt and ankle heels to match, I was channelling my inner grunge self; topping it all off with a fedora hat and leather jacket. I am now bloomin' obsessed with these shorts, they turned out quite okay wouldn't you say? You will be seeing a lot more of them; here's to grungy greatness! Have you DIYed anything lately? If so, leave me a link below and I'll be sure to check it out. We are trapped in what we created, Ombre creep! 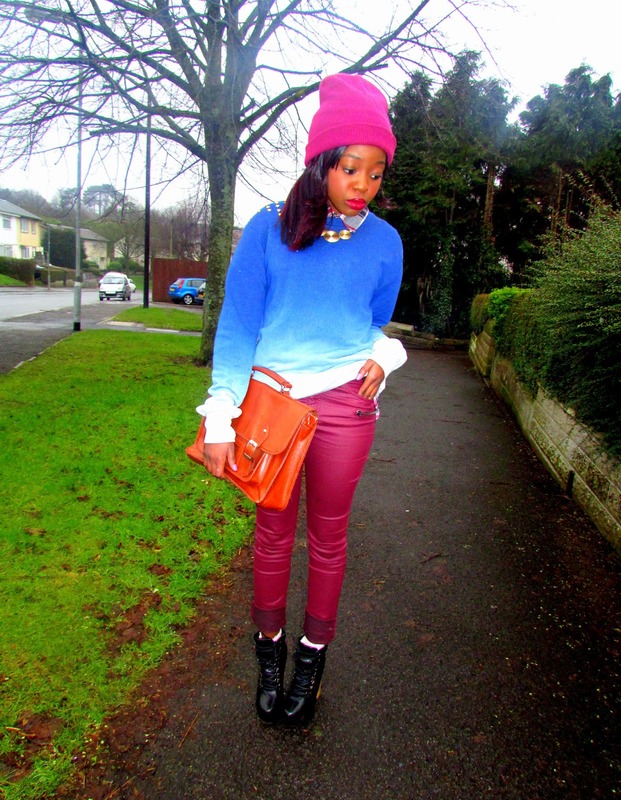 Ebay Beanie / Primark Ombre Jumper / Peacocks Shirt / Matalan Necklace / H&M Leather Trousers / Amazon.co.uk Platform Boots / Primark Satchel. Since today's post is going to be short and sweet, I am going to put my emphasis on these leather trousers. I woke up this morning my mind set on wearing these amazing leather trousers that I purchased from H&M back in December 2012. Little did I know that it would rain today; I wore them anyway. When talking about the perfect pants, these come to mind straight away; they are freeking F I E R C E! When I first saw these on that sale rack, I think I dribbled a little; it was only inevitable that they would end in my shopping basket and a staple in my wardrobe. I have been lusting over grapes a lot lately, my favourite thing to eat these days, so I'm off to get me some. 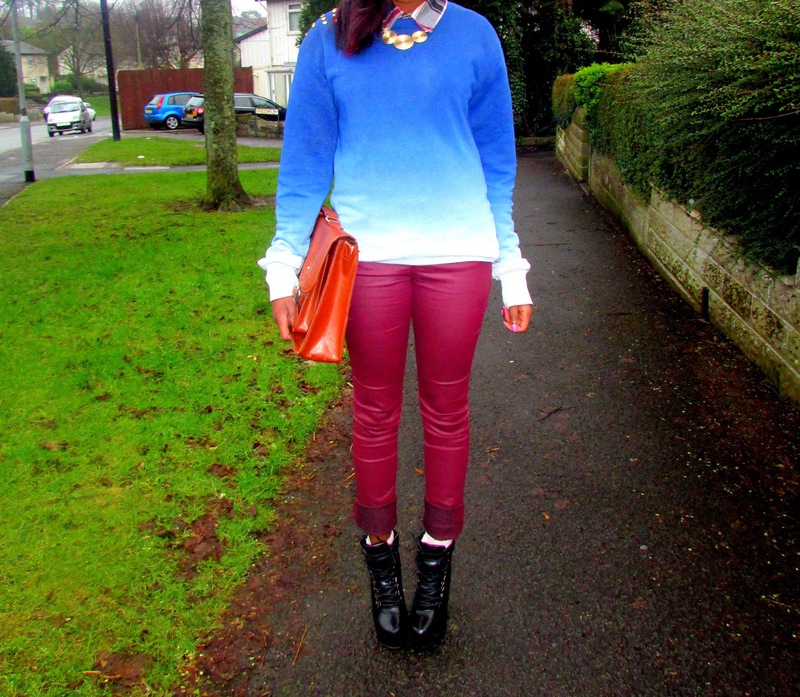 Oh and the colour of my pants reminds me of grapes, such a gorgeous colour! 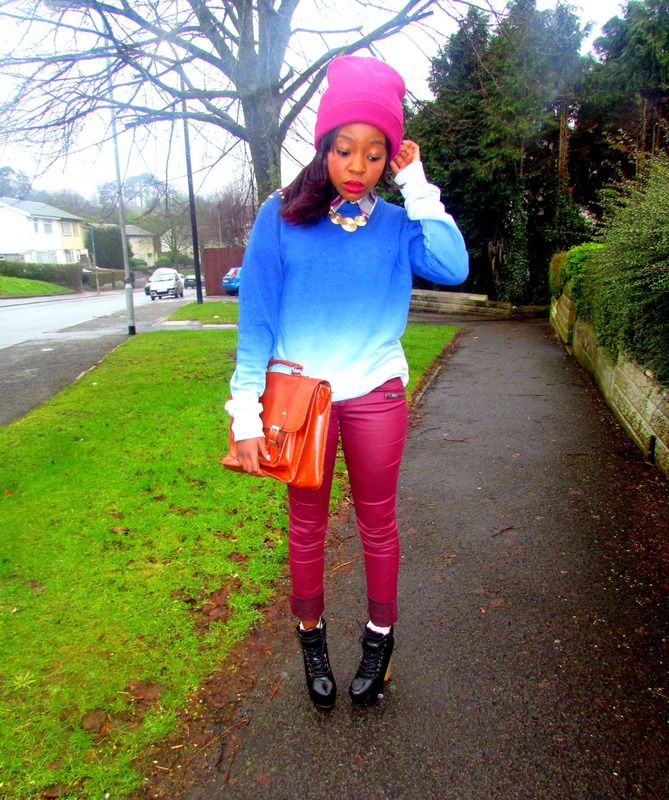 The Ombre jumper which I bought from the men's section in Primark end of last summer is making an appearance again. Its been a while since I wore it but I thought it would go well with these pants. I accessorised this look with a statement necklace from Matalan (£2, it was on sale, woo) and you can never go wrong with a pair of platform boots. 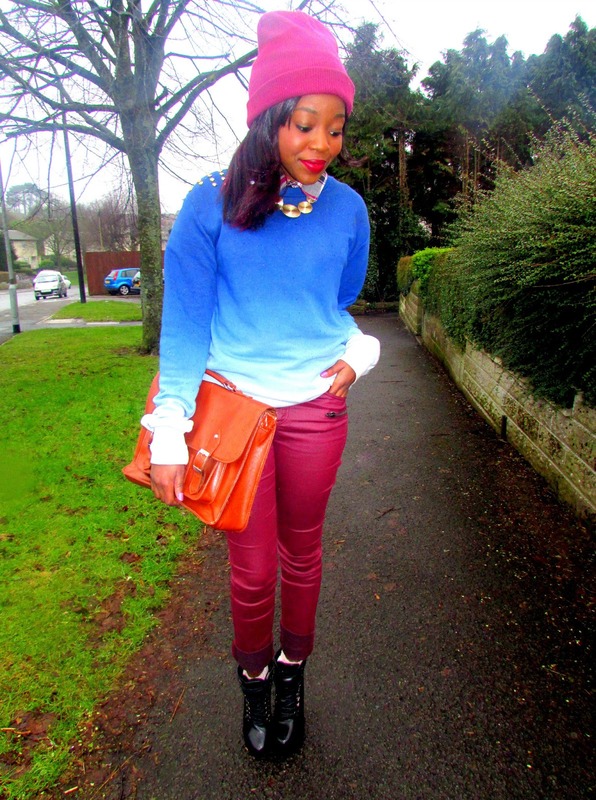 We are having such dull weather; all the more reason to don some colourful pieces. 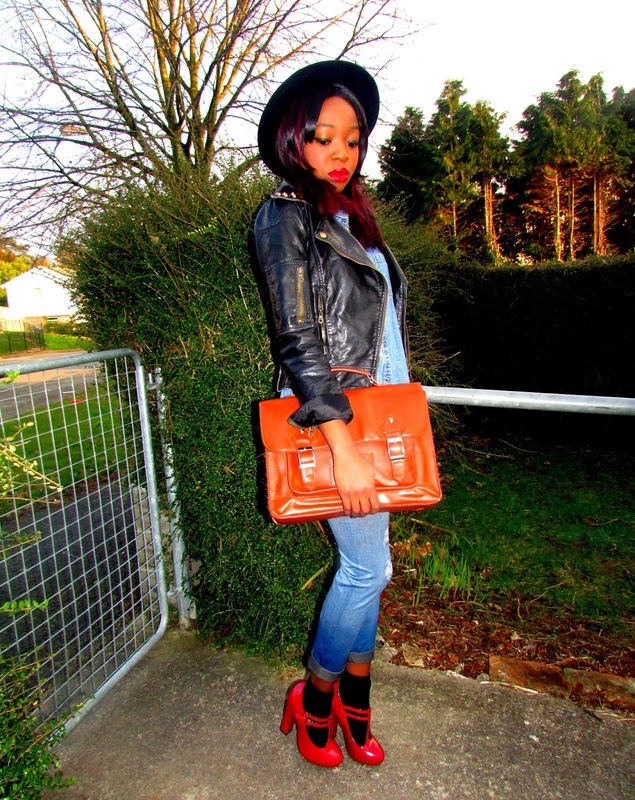 Do you have anything Ombre and what's your take on the leather trend?